We purchased this bed to use in our out-of-state apartment and it looks really nice and has worked very well for our needs. I just wish the legs didn't have such sharp corners so it wouldn't hurt so much when I whack my toes on them while making the bed, which I inevitably do half the time. I also wish the legs were a bit taller so we could store our off season clothing bins under the bed. At least we can get the ironing board under it - barely. Upgrade your home the environmental way with this solid bamboo wood platform bed. Made from sustainable bamboo, this sturdy, transitional-style bed enhances your decor in a style that goes with anything. Elect from a range of finishes to complement your furnishings. Enjoy trouble-free, ready-to-assemble convenience thanks to the included hardware, Allen wrench and live, email and video assembly assistance. Use this bed with your conventional, memory foam or futon mattress, and use it with or without a box spring, depending on your preference. Nice bed but not a full. If you are looking for a full size bed frame this is NOT the frame for you. This platform bed, although described as a full is actually a full/queen which means it fits a queen perfectly and a full size mattress sloppily and this we did not discover until it was fully assembled. I'm so disappointed because I specifically purchased a full size mattress and bunky board prior to receiving the bed frame and now there is a two inch gap between the mattress and frame on all four sides. And because the platform is only 13 inches off the ground, it is impossible to find a bed skirt to fit it. They are all too long. So it makes hiding the gap a big problem. Sigh. This bed had so much promice but it did not deliver. Very good, sturdy frame. You don't even need a drill, just a PH screwdriver and a little time. My only complaint is that it's about 3 inches too long and around 2 inches too wide and the extra space shows through the sheets. Other than that, this is a great bed, perfect for the price. Great frame but it's too big for my full size mattress. it's approx. 4 inches too long and 3 inches too wide. I don't even think i can return because it's already put together. A good sturdy bed although it may be a little pricy from my point of view. But, I'm an old dude and maybe that's why. It goes really well with my new memory foam mattress as I don't have to use box springs and it keeps my mattress nice and flat, like I like it, not all saggy like the box springs. Now I can enjoy a good night's sleep without waking up in the middle of the night wrenching in back pain or in the morning. I feel much better with this combination and should have done it long ago , had I known. Overstock is my favorite on line store and I will continue to purchase their quality products. I bought this bed for my teenage son (16 yo). I needed to get him a bed that would hold his size (200+lbs and still growing). Was very happy with the quality and the color (walnut). Putting this bed together was no problem (make sure your drill is charged-lots of screws). We only needed to get a top mattress since this is a platform bed, so that saves a little money for you. The height of the bed was good too, my son can still put his containers under his bed. The only thing with the frame is there is a small space between the mattress, but you can't see it when the bedding is in place. Still felt this bed desires 5 stars. The best thing is that my son loves his new bed! Hope this info helps with your decision. I am very pleased with this product! Looks great! I love this bed... it's comfortable. easy to assemble, fit's great with my 10inch memory foam mattress. The frame is a great height for sliding storage boxes under it. I love the look! This product was bought for our spare bedroom. No headboard included, but we knew that upfront. Shipped and free delivered ahead of sched. My wife and I put this together in one hour. A screw driver was included but we used my recharchable screw driver. I'd suggest you have one ready at assembly. Also a allen wrench is included for the bigger leg bolts. This went together easy but had to follow the written directions and pictures many times to make sure to get it right the first time. You can put it together wrong very easy if you assume on how to put it together. The finish was perfect. We bought the full size with the lightest color maple. Real wood, no partical board at all. Sturdy with no creeks. We slept on it the first night. Awwww. We have a full size 9" memory foam mattress and it fit perfect, with no box spring needed. Very satisfied with this bed. Now we plan to add a custom headboard. Mounting holes for custom headboards are pre-drilled on the full sze bed we received. Title reads solid wood - this is NOT solid wood. The only solid wood pieces are the softwood PLYWOOD strips for the center support slats. The rest is Laminated particle board, MDF or whatever they call it these days! While I didn't expect top of the line Amish quality for the price, I did not expect anything except real SOLID wood. Also, the full frame is about 3 inches too wide on each side, leaving the plywood slats exposed. If you don't have fluffy bedding, count on the slats showing unless you pull the matress 6 inches to one side, which leaves a glorious 6 inch gap of slats exposed on the other. Do your self a favor - DO NOT BUY this junk. While I love bamboo, one has to be very careful working it. Suggestion to the manufacturer ... you might want to thicken up slats or use a different wood for the slats altogether. Same goes for the so called "lip" on the frame. It is quite easy to split the wood when using screws especially when the screws are so easily stripped. The screws included with the frame for assembly are extremely cheap. If you're going to buy this platform bed be sure to go to your local hardware store and for a few dollars more invest in some sturdy solid screws that won't strip out in a few turns. Also the manufacturer of this frame needs to make sure all holes are lined up and pre drilled fully. I finally had to use my portable drill to complete the pre drilling of some holes and had to resort to my new ratchet screwdriver that had the exact Phillips head screw size to fit the supplied cheap screws. Be careful using your drill because if you drill down to far then the screw will just pull up and then you'll have to resort to a plastic fill-in screw like you use on walls but first you'll need to drill the holes out with a bigger drill bit, fully put the plastic screw inside the hole, put the slat over the almost flush plastic head and now drill your screw in and it will work. After approximately 3 hours the bed was finished. It looks real nice. Seems to just the right height (yes, you will be able to store some stuff under it. Last word on this is for the buyer to be careful walking around this bed or your shins will suffer trauma from knocking into the sharp wood corners. Maybe the manufacturer can include some foam padding for the corners? I was disappointed to see some edges minus finish, but those I can touch up. What I particularly dislike seeing is the center support leg towards the foot of the bed. It's clearly visible when entering the room and is unstained, so it doesn't match the finish. It makes the product look cheap. I bought a full-sized frame and am disappointed at the amount of space between the full-sized mattress and the frame; the slats are clearly visible and the mattress looks like it's swimming in the frame. I also don't like the amount of space between the head of the frame and the wall. Without a headboard the pillows easily fall off the bed. I had hoped for more. My 14 year old son picked out this bed. It was just what he wanted. The price was fair, and it arrived a week after placing the order. As soon as the bed arrived, my son wanted to start putting it together. I told him to wait until his father got home so he could help him. Then, I had to leave the house for about an hour. When I returned, my son was just about done putting the whole thing together. He used a power drill and had no problem with holes lining up or with deciphering the diagram that showed how to put the bed together.He is a bright and talented kid, but still I was impressed that he could manage all the pieces singlehandedly! Everything was well packed in bubble wrap, all the parts were there and nothing was scratched. When we placed the new mattress on it, I was a bit concerned because there seemed to be too much extra space surrounding the mattress. Once the mattress pad, sheets, blankets and comforter were on, however, that extra space was no longer there. The bed looks great. My only complaint is that I hit the edge of the bed with my knee everytime I drop laundry off in my son's room. (Someday I'll learn.) My son loves his new bed. Purchased the bed in black to redo my sons room since he is turning thirteen. He assembled the bed all by himself and loves it. I would recommend the purchase. We had looked at many full size beds and decided on this one for it's simple but elegant design. When we received the bed in what was an amazingly short period of time (one week) at no extra cost, we were not disappointed. The bed came well packaged to prevent damage and was easy to put together. We found this purchase to be better than expected and are happy customers. When I first got this product I was a little skeptical of all wood bed frames because they have never help up for me. I did have high hopes for this one because it seemed like it was good quality, I was impressed with it at first. Over time it didn't hold up, the supports which I thought were a good idea just didn't work out.... they bent over to the sides and stopped supporting the middle, from there it was a domino effect, boards started coming loose and it caused some kind of ridiculous sag along with my wearing memory foam. Despite fixing the frame multiple times it would fall back apart in a matter of days or a day or a few minutes. I had to give in that it just wasn't working and got a metal frame instead which has held strong and rigid ever since. I was very pleased with this product. It was exactly what was needed for the guest bedroom. It was easy to assemble. Aside from the support beam not having hte holes drilled properly, the construction was very good. For a full size bed, the support beam turned out to not be necessary because we kept the box spring as added support. I definitely recommend for a small room with minimal decorative needs. Just a warning about the legs. They are on the outside of the frame and are easily forgotten when walking by. I've got bruised shins & banged up toes until we got used to the new dynamic. Very happy with the Scandinavia Solid Bamboo Full Platform Bed! It was easy to assemble, made of quality materials and is performing as expected. Would definitely recommend the bed! Solid & sturdy wood but need to put all the sides together, then the lip all around the inside of the bed, then the main support and each individual slats, which for me was fine all went together great, just more time consuming than I planned on. I loved the bed! It is was so modernized and made my bedroom look sleek! The bed matched my night stands and armoire that was previously purchased! Unobtrusive and sturdy. Just right. We bought this for my daughter when she transitioned to a bigger bed. We got creative and made our own headboard. Since this bed doesn’t have a headboard there is nothing to lean against but the wall. She props up a couple of pillows when she reads or watches tv in bed. This was a purchase for our son and it fit perfectly in his room. 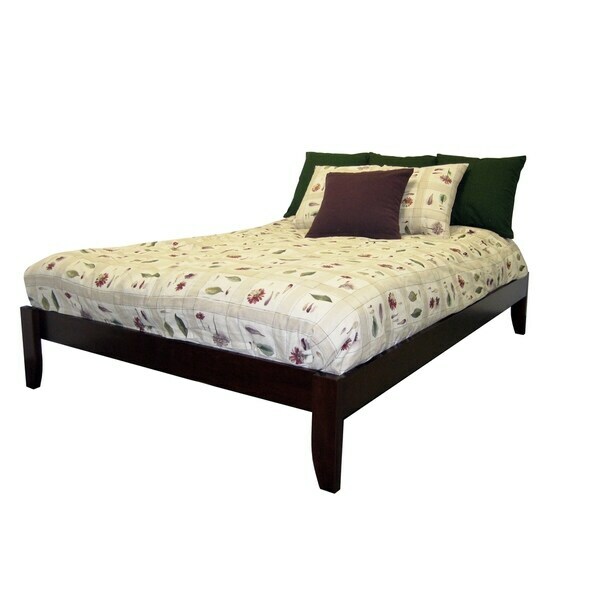 The frame is sturdy and clean and holds his mattress perfectly. We also like that there is room for storage underneath. "Is frame made from wood or particle board?" The frame is made from solid bamboo, stronger than most woods. "I have a full/queen headboard that I'd like to attach to this frame. Does hardware come with the frame only to be able to do that?" No, the hardware to attach the headboard is not included. "Is it full size or Queen, customer question not answered. Will it properly fit a 56 " wide mattress or is there excess space." Hello Stanley S., this will fit a standard full size mattress. Thanks for shopping with us! There is a gap between full-size mattress and edge of frame. We've learned to live with it, but I wish I'd known. "Can I use a different headboard?" Hello Honeyb, this item can be used with a different headboard as well. I personally like ITEM#: 16258620 for another option. Thank you for shopping with us. "Will this bed work with a full-size Sleep Number box spring & mattress?" Hello petluvver, this bed will only accommodate a mattress. Thanks for shopping with us! "A lot of the comments say that this bed is too large for a full sized mattress, but in one of the questions below you say that it will fit. I want to buy this bed but how can I be certain it won't be too large for a full mattress?" Hello goldfish44, this frame can be used with both conventional and futon standard full size mattresses/memory foam mattresses, tandard (54x75-inch). Thank you for shopping with us. "I don't understand why a full mattress doesn't fit this bed; the inside dimensions are 55" W x 76" L. The memory foam mattress I just bought is 54" W x 75" L, seems to me like the fit should be just right. What am I missing here?" Hello randlk, this will fit a standard full size mattress. Thanks for shopping with us!